Fixed longstanding and previously unnoticed bug where global/local shapes--and the end point that sets the semi-diameters of drawn shapes--are improperly offset in the direction opposite the side of the block clicked. ItemStacks' max sizes are now respected by the Modeling Tool GUI when spawning them in creative mode. Allowed all tool settings to be set via a menu that opens when pressing the vanilla Chisels & Bits radial menu key bind. Creates chiseled blocks that are models of collections of blocks in the world. An area of blocks (up to 16 x 16 x 16) is selected by left clicking, and a chiseled block model is created in the world by right clicking. Whether or not a state is chiselable, a mapping of states to bits, and of blocks (i.e. all states for a given block) to bits, can be manually specified via a GUI. Instructions regarding controls/usage are found in the tooltip and GUI hovering text. Many new configs were added for the Modeling Tool. Added SHIFT, CONTROL, and ALT replacement keybinds for tools (Ex: control + left click becomes some other key + left click), as well as a keybind to open the Modeling Tool GUI. 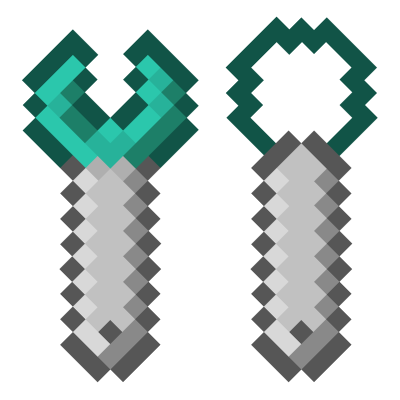 Allowed vanilla Chisels & Bits designs to be edited while holding them upon pressing the keybind that opens the Modeling Tool GUI. The client and server files contain only configs accessed from client or server, respectively. The common file contains configs accessed from both client and server. The number of common configs was minimized, so there are far fewer instances where changing a value will cause client/server desync. When a player joins a server, only their common config file needs to be the same as the server's. The config GUI was split into three primary menus to access these three main config files. These additional config files (sculpting and modeling) cannot be accessed via the config GUI and are automatically read from and written to when using their respective tools in-game. Allowed config bit item stacks to be specified via block ID or by string (modid:name), and added support for specifying them with metadata (Ex: minecraft:wool:7 or 35:7). Prevented recipe configs from being changed in-game and caused the Minecraft restart requirement prompt to display when they are changed.